Who is a good candidate for browlift (forehead lift) surgery? People who have a low, drooping brow and excess skin in the upper eyelid region, as well as those who want to reduce the signs of aging in the forehead region, may be good candidates for a browlift. In certain cases where brow drooping is mild, a non-surgical browlift with temporary dermal fillers may be considered instead of a surgical approach. Dr. Levine will meet with you to discuss whether you are a good candidate for browlift surgery. Can a browlift (forehead lift) be combined with other procedures? Yes. A browlift is often combined with eyelid surgery (blepharoplasty) in order to achieve substantial results. Browlift surgery may also be combined with other cosmetic procedures, such as laser skin resurfacing, fat grafting, facelift, and neck lift. Dr. Levine will discuss with you what procedures or combination of procedures may best suit your specific needs. How is browlift (forehead lift) surgery performed? 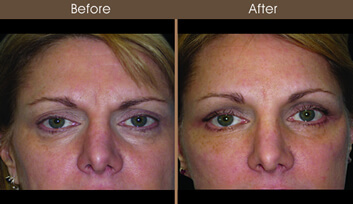 Dr. Levine uses a variety of advanced techniques for browlift surgery, including endoscopic browlift, temporal browlift, and coronal browlift. The technique used will depend on the specific anatomy and needs of each patient. For the majority of patients, an endoscopic browlift will provide the best results with minimal incisions and the fastest recovery. * During an endoscopic browlift, a series of 3-5 tiny incisions are made in the hairline, and a special surgical camera called an endoscope is used to visualize the interior soft tissue structure. Muscles and tissue can be lifted, repositioned, altered, or removed as needed to address forehead wrinkling and excess skin in the eyelid area, while lifting the brow into a more youthful position. A temporal browlift involves small incisions in the hairline and can address the lateral aspects of a drooping brow. A coronal browlift, which requires a longer incision across the hairline, may be indicated in certain cases. Dr. Levine will discuss with you which technique will best suit your specific needs. Will there be scars after browlift (forehead lift) surgery? Scars from browlift surgery are usually well concealed within the hairline. How can I prepare for browlift (forehead lift) surgery? During your initial consultation, Dr. Levine will examine your facial structure, including the amount of drooping and wrinkling in the brow area. He will thoroughly discuss your goals and expectations, including possible risks and the best way to prepare for your surgery. He will let you know what to expect before, during, and after your procedure, and he will answer any questions that you may have. We recommend twilight or general anesthesia for browlift surgery. You will discuss your procedure thoroughly with both Dr. Levine and our board-certified anesthesiologist to determine the best type of anesthesia for your needs. What should I expect during browlift (forehead lift) surgery? Browlift surgery is performed on an outpatient basis in our state-of-the-art, in-office operating suite, which is accredited by the American Association for Accreditation of Ambulatory Surgery Facilities (AAAASF). The length of your procedure will depend on many factors, but on average, the procedure usually takes about 1-2 hours. * After your procedure, you will wake up in our warm and caring recovery suite, where our licensed, registered nurse will make sure you are comfortable and assist in your recovery. You will be able to go home the same day with a friend or family member. What can I expect after browlift (forehead lift) surgery? Every surgery is different, and you will receive detailed post-operative instructions for your specific needs. In general, you may expect to have mild to moderate swelling for 1 week after your procedure. Cold compresses can help alleviate the swelling. Most patients report mild to moderate pain after the surgery, which is usually well-tolerated with medications. * At Plastic Surgery & Dermatology of NYC, our concern for you doesn’t end when you go home. We’re dedicated to providing ongoing care to ensure a fast, safe, and smooth recovery. Dr. Levine will see you for post-operative visits, and he and our staff stand ready to answer any questions you may have about your recovery, as well as your overall health and well-being. Are there minimally invasive browlift options available? Yes. We offer FaceTite™ to firm drooping brows and achieve a more youthful expression. FaceTite™ is a minimally invasive skin tightening technique that uses innovative radio frequency energy to firm the initial layers of skin and stimulate collagen production below the surface, restoring natural-looking contours to your brows. * Dr. Levine can determine if FaceTite™ is right for you during your browlift consultation. How can I find out more about browlift (forehead lift) surgery? Dr. Elie Levine will be happy to meet with you to discuss browlift surgery. Please call our office at 212-988-1800, or make an appointment online for a personal consultation in our New York City offices.